This post is long overdue. I just felt that I had to pen this down. I will get straight to the point. M1 has no real time update on usage statistics on mobile data. While, there’s a function to check for data usage in their app, but it’s only updated once every 24 hours. Not only that, they do not display historical usage. You have to login to their app and do a screen shot or write it somewhere if you want to keep track of your data usage. They do not tell you how much data you have consumed when the bill comes. They just bill you if you have exceeded the bundled data in your plan. I had an increase from 3GB to 4GB with my when I re-contracted my plan. On the old plan I would usually get billed another an additional 1GB or 2GB without knowing how much I have consumed. I’m a heavy user, so I’m not surprise when I exceed the quota. But now with the new plan, I still get billed for the same additional data consumption. So this got me curious. I’m not disputing that I’m using all the data, but I needed to know how much I was using. And coming from a telco background, I have seen enough of screw ups during provisioning. I was actually suspecting my new quota might not have been updated so I had to verify. So I filled up the online customer service form one day to verify my plan and asked for the historical data consumption for the past 3 months. This was the first issue I had. Just look at how many things I need to fill to get help. I didn’t want to call up and wait so I filled up the minimum mandatory fields to submit the form. The customer service folks called me back after a few days. The very interesting thing is that the customer service told me they had no history of data usage. That is IMPOSSIBLE. Let’s not even start with the fact that I did usage accounting in telcos for many years. Any other customer will be shocked to be told that. If there’s no history, then what happens when there are disputes? Retention of usage data has a lot of other implications beside billing. Of course, that answer wasn’t acceptable to me. I pressed on for the answer and eventually I got the information I wanted. The professionalism was questionable. But the main grouse here is why doesn’t M1 show us how much we have consumed when the bill arrives? The M1 app should show current usage statistics. If the usage statistics cannot be updated regularly, at least show us the historical usage in the app. I can’t think of any good reason for not having this. The monthly bill should reflect the data usage for the month. Call statistics are more difficult to track and they all in the bill. Why can’t data usage be included? 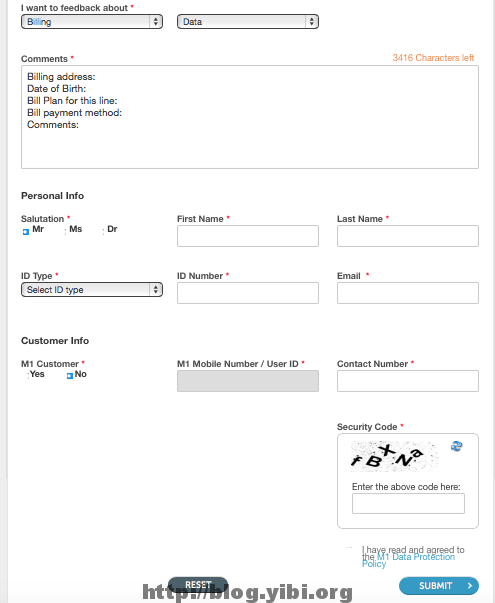 The online customer service forms have way too many things to fill up. Why do I need to submit my billing address, my bill plan, my date of birth, my payment method etc before I even start writing anything about my question. I know how the customer service managers would love to have all the information readily available the moment they open the email. It definitely makes life easier for them. But please remember. Customer service is there to make life easier for customers, not the other way round. In my opinion, they just need my name, contact number and my query. The rest of the information is in the CRM. M1 is probably the smallest player after SingTel and StarHub. These are the basic thing that should be done well to be on par with the other 2. If this is not done, then it is going to be more challenging for them when the 4th mobile player joins the competition with new ideas. Good luck M1.